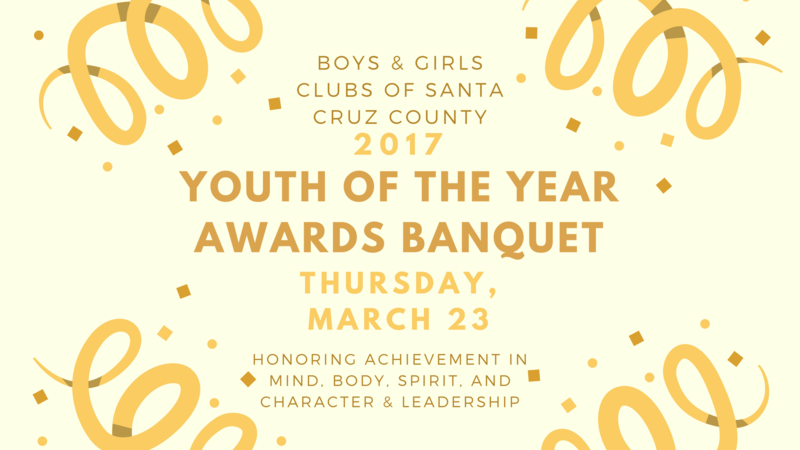 Youth of the Year is Boys & Girls Clubs of Santa Cruz County’s premier recognition program. Club Members are selected to receive awards for their achievement in academics, athletics, arts, and character & leadership. Awardees are shining examples, and living proof, that great futures start at Boys & Girls Clubs of Santa Cruz County. We are looking forward to a terrific evening honoring some of the most important members of our community- our youth! Join us Thursday, March 23rd from 6-8pm at Holy Cross Hall to celebrate! Tickets are $50 a person or $400 for a table of 8. You can also donate $100 to sponsor a family. To RSVP contact Alexandra at alexandra@boysandgirlsclub.info or call 831-423-3138 ext 26. Please RSVP by Thursday, March 16th.